A growing number of universities are pledging to become climate neutral. In Central Virginia, some schools are using green building techniques, alternative energy and education to reach sustainability goals. On this Earth Day edition of Virginia Currents, Catherine Komp reports. 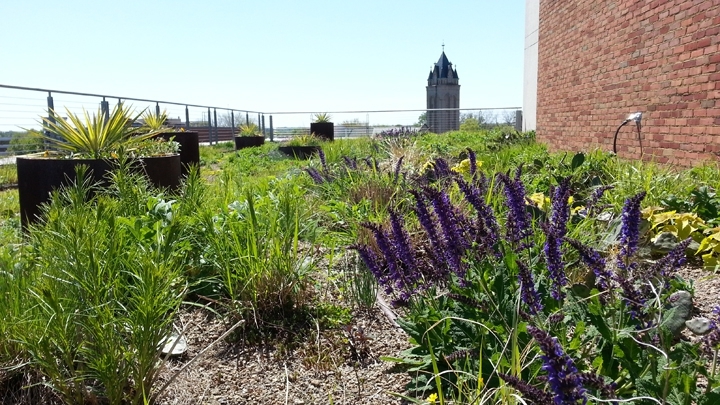 Learn More: Find more details about VCU's LEED certified buildings and its Sustainability Plan. Read UR’s Climate Action Plan. Thanks to WCVE's Charles Fishburne for providing sound for this story. Hear more details on UR's new solar initiative on Science Matters. At Virginia Commonwealth University’s Cary Street Gym, students shoot hoops, play badminton and climb a massive rock wall. The expansive facility, designed around the historic City Auditorium, is one of about a dozen green buildings on campus. Meredith Hawkins is an Associate Director at the gym. Meredith Hawkins: When they did the building they used a lot of sustainable resources like our wood floors are sourced properly and they did a lot of recycled material in the building, I think it was about 25% and then about 25% is also locally sourced. The building uses daylighting, efficient water fixtures, and green cleaning products. They recently cut towel service, so there’s less to wash and dry. Hawkins: We do a lot of the typical stuff, we use low flow shower heads and we have dual flush toilets. One neat aspect is we have two cisterns that are filled from the water off the roof of the building and those feed our drip irrigation system so all the plants around the building we don't need to use any water for that, they're completely run off the cisterns. With more than 34,000 students and 7 ½ million square feet of building space, VCU is always trying to improve efficiency. It created a Sustainability Office in 2009 and joined hundreds of other higher ed institutions pledging to cut carbon emissions. The University aims to be carbon neutral by 2050, says VCU Sustainability Director Erin Stanforth. Erin Stanforth: While we haven’t made direct progress on Scope 2 Emissions which is purchased electricity, our largest source of emissions, we’re working on behaviour change which is the most difficult piece of reducing emissions. Carbon emissions are analyzed in three main categories called scopes. Scope 1 includes things that can be controlled, like a vehicle fleet or fuels for heating. Scope 2 is indirect emissions, like purchased electricity. And Scope 3 includes other indirect emissions, like waste, commuting and out-of-state travel. In the waste department, there’s been significant progress after VCU switched to a methane capture technology for materials sent to the landfill. Stanforth: They went down tremendously. In fact, our waste numbers went down so much that it's not even a source of greenhouse gas emissions anymore. In addition to promoting recycling, shutting off lights and biking or car pooling, VCU is also encouraging behavior change through academics. Dozens of classes address aspects of sustainability. Students can also earn an sustainability certificate. And in the Fall, an “Eco Village” program begins for freshmen living on the same floor of a residence hall. Stanforth: The purpose is to generate immediate behavior change from students that are coming right in, because generally speaking students that are coming from high school straight to college, may not have the best habits but they are open to change. The University of Richmond is pursuing similar strategies to reach carbon neutrality by 2050, including using LEED building standards and installing a new 205-kilowatt solar array with bifacial panels. Rob Andrejewski is UR’s Director of Sustainability. Rob Andrejewski: Sustainability’s got to be a triple bottom line. It can't just be about, for us environment, for the folks who make decisions, finance. It has to be about a combination of: does it make environmental sense, is it ethical and does it make economic sense. Like other VCU and universities, the school is also expanding sustainability-focused academics, so students are better equipped to respond the planet’s changing climate. Back at VCU, tucked behind a parking garage, is another sustainability project. This could have become another parking lot, but today, it’s a learning garden. About 50 burlap sacks, donated from a coffee roaster, line one side of the parcel. Hannah Wittwer: And they’re all filled with potatoes, which you can see coming up. They started coming up last week. Hannah Wittwer is the garden coordinator. Wittwer: If everything goes according to plan, that could be 300 pounds of potatoes or more. Students and community members will help grow the produce, which will be donated to VCU’s RAM Pantry and the nearby Center for High Blood Pressure. Food and food systems are a huge part of sustainability, says Wittwer. Wittwer: Even if you think about the word sustainability, you’re literally- this is helping you to sustain yourself and that personal sustainability or community sustainability is something that sometimes is missing, I think, from the conversation. VCU and University of Richmond also recently co-hosted a “Power Dialog.” The event brought together students with environmental advocates and industry representatives to discuss climate change and advancing clean power. For Virginia Currents, I’m Catherine Komp, WCVE News.